Places that take your breath away and make you wonder about how you could have ever truly lived without seeing them. These are not those places. These are 15 moments where we’d prefer to silently look around and then just nope right out of there. 1. I’m getting some good shots here, but just in case, is there any chance we can get a little closer? What? You’re going to have to speak up, it’s a little windy here and I’m having some trouble hearing you. 2. So it seems like it’s a bit windy out. How do I know this? Well, as it turns out I came out onto the balcony to see what the weather was like and I ended up at Vlad’s place. You know Vlad, lives three buildings over? 3. When you’re choking because the air is literally solid but you gotta keep those Instagram followers happy. What seam? What are you talking about, I don’t see a seam. Y’all #Crazy. Taking The Birds and remaking it as The Birds 2: Birdnado is a little out there. I mean, sure, with modern technology you can make it pretty terrifying but…oh, Jeff Goldblum’s in it? God, fine. I guess. 5. Yeah I get it, there’s a volcano erupting over there. So what, do you know how much these green fees were? You see that shot? Straight as an arrow down the fairway. I’ve been working on it. Hey, is it a little hot out? Are you noticing that? continuing to play as though nothing were wrong while all hell breaks loose in the background. 6. The HR write-up on this incident was, as it turns out, pretty epic. What they don’t tell you is that I got the place evacuated and gave us an excuse to head down to the bar for the rest of the day. 10/10 would get nearly blown up again. 7. Oh good, I don’t even need to drive through a hurricane to experience the joy of having a tree through my windshield. Are trees in a car grounded? What happens when lightning strikes? There are so many scientific questions we’re about to find the answers to. 8. 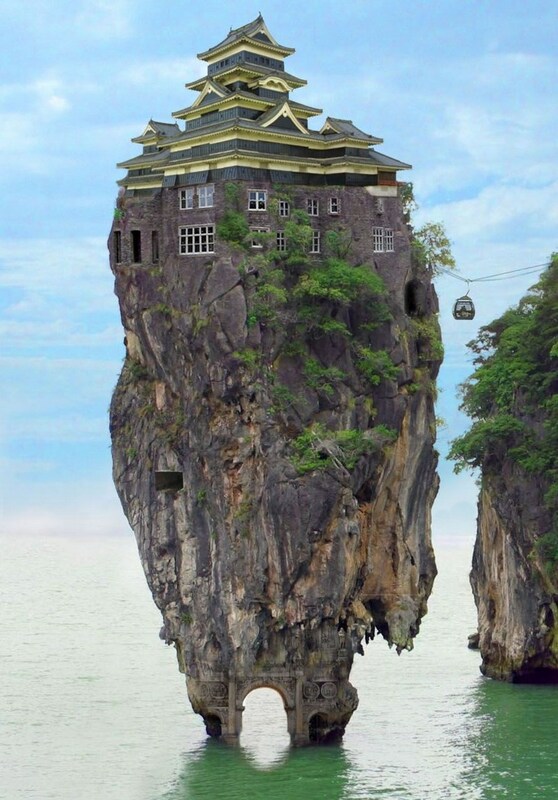 This house is crazy — I went looking for a bathroom and ended up cliff diving. Good thing the place is built on such a solid foundation. Hey, did you feel that tremor? 9. Let’s go swimming at night, you said. It’ll be fun and romantic, you said. 10. Industrial mining run-off or number one sign of the apocalypse? I don’t really care which it is, all I know is that there is absolutely no way that I’m eating anything that came out of there, so you may as well throw them back. 11. It’s bad enough when the zombies rise up to eat the living, but do they have to be on fire? What’s next, gigantic vampires shooting lightning out of their eyes? Oh, that’s on the schedule? Great. 12. There’s a place I like to go sometimes where I can sit and think. 13. Mark, this is the very last time I let you pick the spot for our super-secret urban flash rave. Everything was fine until those extras from The Warriors came running out of the ruins. 14. Oh good, the gator and the sharks have come to an agreement. This isn’t ominous at all. 15. Farmer John and the dragon had a long-standing deal to take care of the fields after the harvest. The neighbors weren’t particularly happy, but after the dragon ate a couple, there wasn’t much complaint about it.